The Framers Forum • View topic - How to get picture frame corners flush? How to get picture frame corners flush? 1. Cut the mitres on a Morso. One thing I have done is loosened the clamp, pulled up one half of the mitre to align the corners perfectly, then retightened the clamp. That works well for the most part, but using that method you end up with a slightly warped frame. I understand wood is a little bent and warped to some degree anyway, but I'm wondering if anyone had any good tips to get the front of my frames as flush and my frames as not warped as possible? 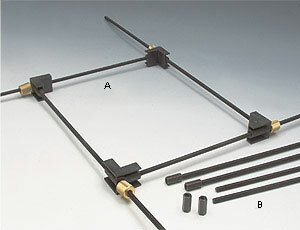 Are you gluing your frames first and then underpinning or don't you use an underpinner at all? If you do have an underpinner, then glue and pin at the same time. I glue oak frames using a Bessey band clamp (highly recommended) and occasionally will get a raised front surface but it is easily rectified with some sand paper which you can't do with finished moulding All I can say is to make sure you have a flat surface to work on and push each corner down hard on your workbench before tightening your clamp. Also, always do a dry fit first and if you have trouble with a raised corner swap over a length or two to see if that helps i.e. swap the short sides and dry fit again and if you still have a raised corner swap the long sides over... it can sometimes work. Do you mean the top of the frame is not sitting level? If so it probably is from a warped piece of wood. Does the wood sit flat and straight before you cut it? How long have you had it and how are you storing it? If you sit the corners together on a flat table are they perfectly flush at that point? Maybe assemble everything face down instead of face up. I use an underpinner so it pushes up against a pad so the top is almost always level unless the wood is particularly warped. Sometimes I can force it into place, but if the wood is narrow it can be noticeable. I glue first, let it set, then underpin. I actually started gluing and underpinning at the same time, but I don't think my underpinner table is level, so it causes even worse problems. I have tried the things you've said and I've tried something similar to the clamp you mentioned, and I didn't like the way the corners could sometimes slip past each other, the reason I went with the 4 way clamp was it has a solid corner. However it can sometimes can damage the corner if you tighten too tight, which is the downside. Yeah the front of the molding being level. It's brand new molding, a few weeks old, stored horizontally, and when I place it on a flat surface it's never 100% level, there's always slight differences however they can be very minor. I've tried face down and it comes out a little worse as when it's face up I can bend the molding to fit perfectly, without me doing that it's always a little out. But again, I think my underpinner is a little out so they don't lie flat on it, which is a shame. I'm using this from Mainline https://mainlinemouldings.com/index.php ... y=010-0201 Is this more common in cheaper and thinner moldings? Have you measured the flatness of your V-nailer's table for flatness with a precision straightedge that is not made from your stock of frame moulding? A quick visual observation with the metal table of the V-nailer and a rail of wood moulding is not going to be precise enough. The moulding might actually be warped or twisted. The picture you uploaded suggests twisted moulding. Measuring for flatness vs twisting require 2 separate measurement techniques. JFeig wrote: Have you measured the flatness of your V-nailer's table for flatness with a precision straightedge that is not made from your stock of frame moulding? A quick visual observation with the metal table of the V-nailer and a rail of wood moulding is not going to be precise enough. The moulding might actually be warped or twisted. The picture you uploaded suggests twisted moulding. Measuring for flatness vs twisting require 2 separate measurements. yes I have measured the flatness of my underpinner table, and I've levelled it as much as possible, but it's still not exact. It's the old morso underpinner I have. I came with my morso cutter, it's well built but the table is in two bits, and it's quite difficult to get them level. But the picture I posted was glued and set prior to going into the underpinner, that was glued on a flat surface using my clamp. I had a suspicion it was the wood though as the surface I was on was completely flat and it's always a little out on at least two of the corners every time I make a frame (out by a very small amount, not to the extent that's in the picture above, that was just a very noticeable bad corner) Is there any fix for molding that maybe slightly out? I thought maybe running it though a thicknesser to make sure they were all at least level, but on finished molding it would ruin the edge so I think it's possible. Check to see that the moulding is not rhombus shaped. The easiest way to do that is to take a rail of moulding and clamp it to a flat surface at one end. At the other end, look at the cross-section and see if it is twisted, or if there is a gap on the back or rebate side of the moulding. That's a twisted piece of moulding if ever I saw one and I've seen a lot. and you somehow managed to wrestle it to fit, the resultant frame would forever be under torsion. Not good. it was twisted when you got it. If it's going to twist it will do - nothing will prevent it and nothing will cure it.